Hello Piso Fare aficionados! Want to avail cheap tickets? Watch out for Air Asia Red Hot Sale two days from now! Mark your calendars for the upcoming big sale of Air Asia! During this AIR ASIA RED HOT SALE, promo tickets can be booked for as low as P17 for select domestic one-way trips: Clark to Iloilo, Clark to Tacloban, Clark to Puerto Princesa and P551 ALL IN Fare one-way travel for select international destinations: Manila to Bali and Jakarta among others. Expect many other local and international destinations to be part of this promo. We will update you on complete list of sale ticket prices and destinations as soon as these are available. So, follow us in our FB page for updates. Booking for the Air Asia Red Hot Sale promo will start on March 4, 2018 at 12 midnight exclusively for BIG members. For non-BIG members, the sale tickets will be available at 12 midnight on March 5, 2018. The official booking period is March 5-11, 2018 only. Promo tickets during the Air Asia sale are great for trips from September 3, 2018 until May 28, 2019. 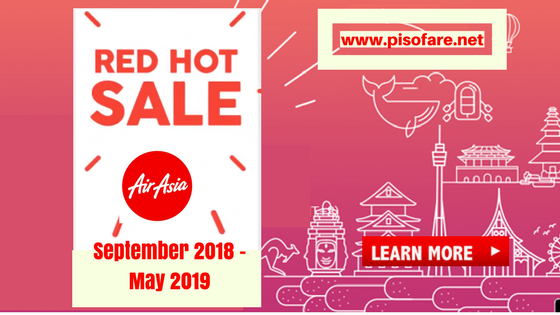 Thus, this promo can be aptly called Air Asia Red Hot Sale 2018- 2019 as it can be used for travel on September, October, November, December 2018 and extended to January, February, March, April, May 2019. The Air Asia Red Hot Sale where in base fare is as low as P1 is also referred as Air Asia Piso Fare promo. Air Asia sale tickets as low as P17 can be availed by booking online at Air Asia website: www.airasia.com from March 5- 11, 2018. No promo code required in booking the Air Asia Red Hot Sale. However, you need to have a lot of patience when searching the sale tickets. The promo is across all Asia destinations, hence, travelers from other countries will be also accessing the airline website at the same time. So, as early as now, prepare your planned travel dates and passengers details. Have second and third options, just in case your original flying dates are not on promo. Read the 2017 List of Philippine Holidays and long weekends 2018. Promo tickets of Air Asia are limited and can be availed on a First Come. First Serve basis! Book the cheap fares as soon as booking starts. Check updates of Air Asia red hot sale 2018- 2019, Piso Fare 2018- 2-019 and other airline promos in our Facebook: PISO FARE TICKET!